What's Next: The New Netflix Narrative: What happens when a breakout company starts to lose momentum while others catch up? Reed Hastings may soon find out: Netflix added 5.2 million subscribers last quarter, missing its own forecasts by more than a million. The slowdown comes amid increased competitive pressure from Apple, Amazon and Google, as well as AT&T, Comcast and Disney. • Does this signal a future slowdown in subscriber growth? • If so, will Netflix be forced to raise prices again? • How will Netflix go toe-to-toe with the spending capacity of mega-competitors like Apple, Amazon and Google that have entered the premium content arena? • How is Netflix going to handle the $8 billion in debt it will soon have, as well as the additional $18 billion in content obligations? These aren't new concerns. They've lingered over Netflix for some time, even if wide-eyed observers sometimes fail to ask about them. But if Netflix often receives a rubber stamp from Wall Street, it's because it often over-performs. Now that it's under-performing again, Netflix may have to face the music. We spent last weekend in Los Alamos, two hours north of Hollywood in the Santa Ynez wine country. The town is home to Bob's Well Bread, the phenomenal bakery and lunch stop headed by Bob Oswaks, the former Sony marketing president who helped launch Seinfeld and Jeopardy. Have the Italian sandwich and a bottle of Margerum Sauvignon Blanc (special made for Bob's). Sit outside. Forget about work. When thinking about Netflix, it's important to remember that the company doesn't see itself as one service among many. It sees itself as the future of television. Netflix is spending huge on the assumption that it will one day replace TV, which means it's basing its financials on a future in which the whole world (or a fair percentage of it) subscribes. The entire business model is built around subscriber growth. As chief content officer Ted Sarandos once said, "More shows, more watching; more watching, more subs; more subs, more revenue; more revenue, more content." 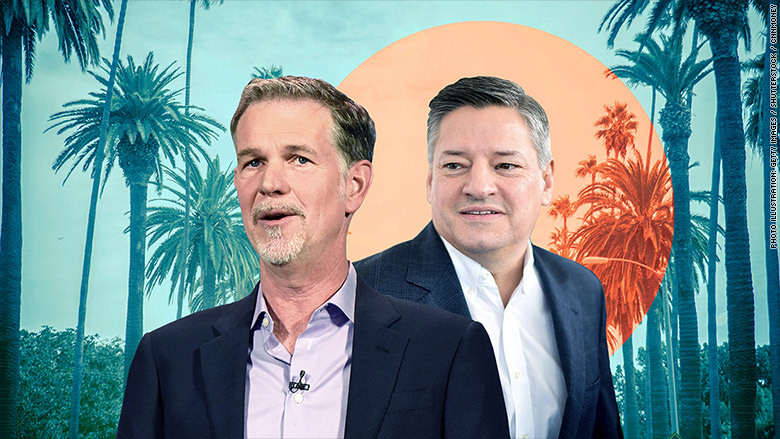 • "Netflix's goal is to have more subscribers than any other video service in the world, and to be the primary source of video content for each of these subscribers. The company doesn't want to be a leader in video, or even the leader in video -- it wants to monopolize the consumption of video; to become TV. This ambition has several important consequences, especially relating to the company's spend." • "Despite the imminent entrance of Disney and the increased investment AT&T has promised in HBO, Netflix, by virtue of having a huge head start and huge user base advantage, along with a demonstrated capability to both grow subscribers even as it increases prices, is well-placed to leverage its role as an aggregator." "Breaking Bad' creator Vince Gilligan has extended his stay at Sony Pictures Television for another three years," Variety's Cynthia Littleton reports. "The renewal of Gilligan's overall deal is a win for the studio at a time when A-list showrunners are being heavily courted by Netflix and other streaming services for exclusive production pacts." What are you, if you're not Netflix? If Netflix succeeds in replacing television, the goal for others -- Apple, Amazon, AT&T, Disney, etc. -- will be to provide enough differentiated content that it compels subscribers to add their services on top of Netflix, much as cable subscribers add HBO or Showtime. That's OK, because unlike Netflix (or HBO or Showtime), those companies are really trying to sell you on something besides content. Apple wants you to buy iPhones, Amazon wants you to buy Prime subscriptions, AT&T wants you on their network, etc. If a little premium content is what's needed to sweeten the deal and take customers away from Android, Walmart and Verizon, respectively, then so be it. The outlier here is Disney, which is really just selling you on content. But Disney may have a hold on so much quality content -- Marvel, Pixar, LucasFilm, etc. -- that it can get away with it. FCC chairman Ajit Pai's declaration that he has "serious concerns" about Sinclair's purchase of Tribune Media stations has thrown greater uncertainty into the general media M&A landscape. • "This is now the second market-transforming media deal that has recently gone from a regulatory sure thing to a gamble. Like the Department of Justice's challenge of the AT&T-Time Warner merger, Pai's issues with the Sinclair deal run against the business- and merger-friendly posture most GOP administrations take." • "Fox and Sinclair have had a fraught relationship that goes back more than three decades. ... In theory, Sinclair's purchase of Tribune would have given it a stronger negotiating hand in talks with Fox about how to divvy up ... fees." What Next: President Trump vents to communications chief and former Fox News exec Bill Shine about the negative coverage of his Helsinki conference with Vladimir Putin.